Home/People and Sound/Investigate Marine Animals/How is sound used to estimate marine mammal abundance? 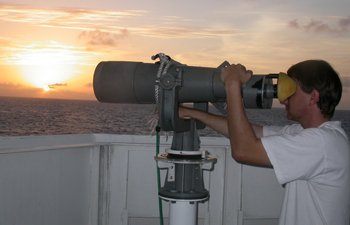 An observer uses high-powered binoculars to scan for marine mammals from the deck of a ship. Image credit: NOAA. When scientists study a marine mammal population, they often ask, “How many individuals are there?” Estimating abundance (population size) and animal density (number of animals per unit area) are critical to properly understand marine mammal ecology as well as make important and effective management and conservation decisions. Traditionally, visual surveys have been used to estimate marine mammal abundance. Observers, either from the air or aboard a ship, survey a specific area (or “transect”), actively searching for animals. Sightings are used to calculate an estimate of the number of marine mammals in that area. These numbers can then be extrapolated, and/or combined with other estimates, to calculate an overall population abundance. Population numbers can also be used to identify seasonal trends in abundance for animals in an area. Visual surveys are limited by weather and light conditions. In addition, all species of cetaceans spend time below the surface where they cannot be detected. Some species, such as deep diving beaked whales and sperm whales, may spend about 80% of their time below the surface. Other species are distributed over a large area of the ocean, or may display ship avoidance behaviors. Passive acoustic sensors that receive underwater sounds help overcome many of the limitations experienced with visual surveys. They have been incorporated into survey methods to improve animal abundance estimates, especially for cetacean surveys. The use of passive acoustic sensors may allow for more animal detections across larger ranges than would be obtained from visual methods alone, and facilitate the detection of animals that spend a large amount of time under water. Researchers deploy a Real-time Automatic-Detection Buoy from the back of a ship. The device being deployed is buoy “AB” for the 10-buoy passive acoustic array currently deployed in Massachusetts Bay to monitor right whales. Image courtesy of Cornell BRP/WHOI. Estimating animal abundance using passive acoustics involves three main steps: detection, classification, and localization. Each of these processes involves sophisticated tools and has its own set of challenges. The first stage is detection, or the process of determining that animal sounds are present. This may be easy for animals that vocalize a lot, but every member of a target population may not vocalize. Although a lot of sounds may be recorded in one area, this does not necessarily mean that there are a lot of animals – some animals may pass close to a sensor and be detected more easily, or one individual may vocalize more often than others. Both false positive detections (detection of a whale when it was in fact something else), and false negatives (the potential for not counting a silent animal), are issues that must be considered. Ambient noise also impacts call detections, as an increase in background noise results in a decrease in the ability to detect calls. The second stage in estimating abundance is classification, or the process of determining which species is making sounds. To do this, scientists need to know the characteristic vocalizations of the target species. Although the vocalizations of some cetaceans, such as right, bowhead, sperm, and humpback whales, have been well described, this is not the case for many other species of marine mammals. Many researchers are actively involved in developing new techniques to improve classification of animal sounds. Data from the detection and classification of animal calls can be used in one method to calculate animal density, known as “cue” (call) counting. Cue counting combines the number of calls detected with estimates of the average call rate per animal per unit time, to calculate the number of animals detected. However, call rates may vary depending on the animals’ behavioral context, and for most animals, little information is available. The final stage is localization, or determining where an animal is when it is making sounds. Localization involves complex computations, but when possible, can improve animal density and abundance estimates by determining the actual number of individuals calling. Localizing acoustically active animals usually involves a process of triangulation using multiple sensors. Both towed hydrophone arrays, as well as fixed acoustic sensors, can be used. The bearing (direction) to a sound source can be obtained by comparing the arrival times of the sound at different sensors. When data from multiple sensors are combined, the location of the animal can be determined. Accurate measurements depend, in part, on the number and configuration of passive acoustic devices and the type of acoustics modeling used. 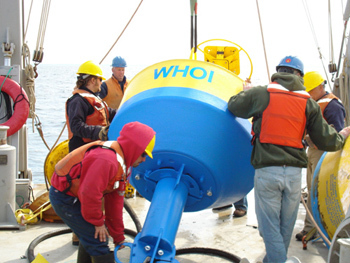 A hydrophone array can be towed behind a ship or placed on the seafloor. It contains at least three hydrophones that pick up sounds in the ocean. Sounds, such as whale calls, are received at different times because the hydrophones are different distances away from the sound source (i.e. whale). Passive acoustic sensors have proven to be an effective complement to traditional visual surveys, and many scientists are now combining these techniques to enhance abundance estimates. For example, passive acoustic sensors have successfully been used in abundance estimates for several cetacean species including right whales, beaked whales, sperm whales, humpback dolphins, and finless porpoises. In fact, critical information about an otherwise unknown population of endangered north pacific right whales in the Bering Sea was gathered through the use of acoustics to assess the distribution and abundance of the species. Estimates of minke whale abundance in Hawaiian waters were also made during a combined visual-acoustic survey. Minke whales are considered rare in Hawaiian waters, and these reports were the first from nearshore (<50 km) waters, despite years of shipboard and aerial surveys.